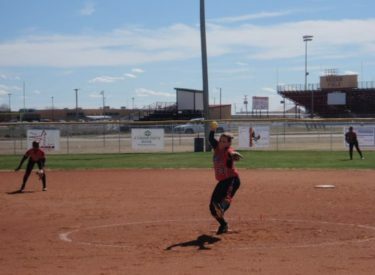 Liberal and Hugoton split a softball double header Thursday afternoon and evening at the Liberal Softball Complex. Hugoton won 15-7 before LHS won 15-8. Hugoton opened their season with a split against Southwestern Heights and they looked like the team who had played this season in game one. Hugoton broke open a 4-3 game with five in the fifth. Brook Rogers was 4-5 with two doubles while Tessa Rindels was 3-5 with a triple. Fantasia Easton was 3-4 and Nataly Hernandez was the winning pitcher. In game two, LHS turned the tables. Ramey Petty pitched Liberal to the win and Liberal’s defense improved. LHS freshmen shortstop and sophomore second baseman Riley Hay even combined on a 6-4-3 double play to end the sixth. Chapman soared around the bases scoring five runs. Petty, Hay, Emily Bayouth, Micah Hasik, Caity Hinnergardt, and Kaitlin Ralston had two hits a piece. Liberal is 1-1 and Hugoton is 2-2. Liberal hosts Goodland Monday.